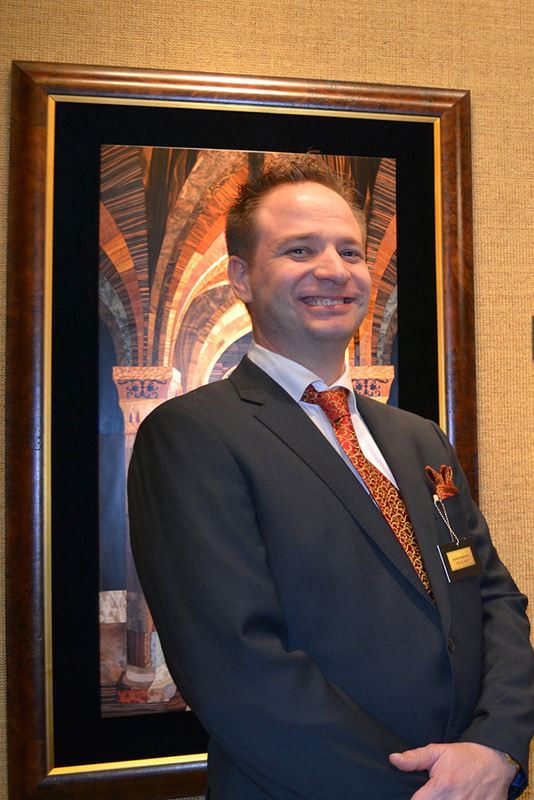 Kalman Radvanyi has developed the ancient art of marquetry to a level never seen before. A Radvanyi artwork has been described as a three dimensional “painting with wood” Kalman thrives on the most difficult depictions of gothic architecture. Hundreds of species of wood are seamlessly cut into the perfect position. During the process the perfect timber must be chosen; the perfect knot, the perfect grain, the perfect shade all to accommodate the prestigious perfection that is the hallmark of a Radvanyi Artwork. Kalman Radvanyi is acknowledged worldwide for the beauty of his designs and meticulous proficiency in creating such fine detail. Quite simply there is not another person that is able to emulate the level of marquetry skill, precision and intricacy of design displayed in a Radvanyi artwork. Kalman envisions each initial design as a three-dimension sketch in his minds-eye. Each organic section is sourced from across the world and methodically hand-sculpted using tools designed and molded by Kalman himself. The artist harmoniously combines ancient and modern techniques (many developed by Kalman himself) to consummate a flawless result. The rendition of a Radvanyi Artwork work, at its core is to find pure, natural techniques that have been lost in the contemporary world of manufacturing. Kalman combines art, science and skill to create a hand-built solid wood frame to encase each artwork. Each hand sculptured piece of wood is often so delicate; measuring only one tenth of an inch in thickness, requiring a calibre of precision only shown by Kalman Radvanyi. A Radvanyi Artwork can take up to six months to create and perfect incorporating up to one hundred and thirty different species of natural timber; some of which are over a thousand years old. 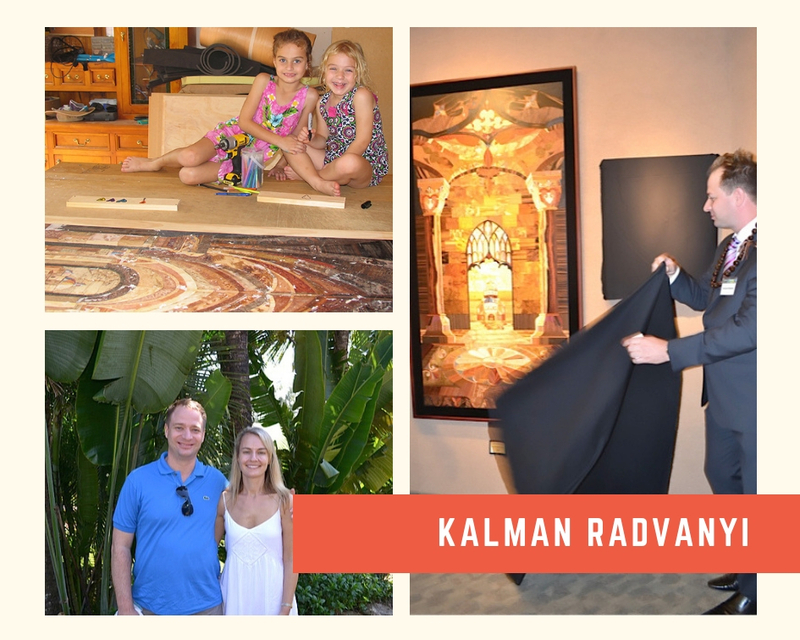 Encouraged by his wife, Kalman can be found working in his studio with his two equally artistic young girls by his side. Kalman Radvanyi is an indubitable master of extraordinary creativity in both traditional and contemporary marquetry design. Kalman combines the subject matter, mathematics, perspective, sketching, molding and placement of the perfect timber to create a unique masterpiece.